It's going to be good weather this Friday and we have two very special readers! April Grey has two urban fantasy novels out: Chasing The Trickster and St. Nick’s Favor. Her third novel, Finding Perdita is due out from Caliburn Press “Any Day Now.” Her short stories have been published on line and in print anthologies. Many of these stories can be found in her collections, The Fairy Cake Bake Shoppe and I’ll Love You Forever. She edited about 20 novels for Damnation Press and is the editor of the Hell’s series. All are available through Amazon and Smashwords. April A/K/A Avril when she isn't writing also volunteers at Oasis Community Garden. 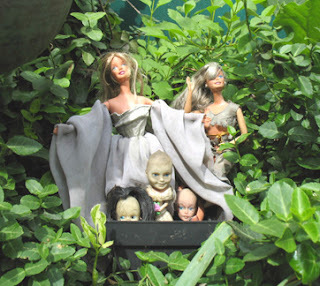 She and her family live in Hell's Kitchen, NYC in a building next to a bedeviled garden. Gremlins, sprites or pixies, something mischievous, lurks therein. Someday she'll find out. Next week 7/28 We will have Steven Van Patten and Marc Abbott reading. Please come back then!